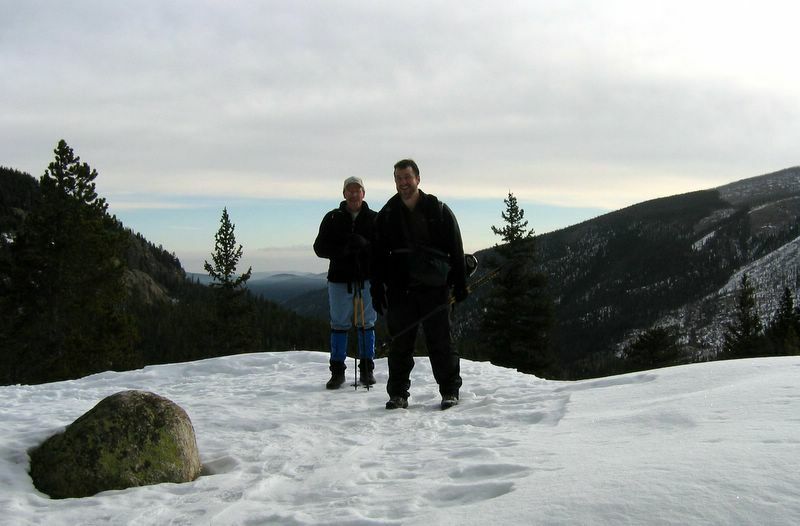 January 29, 2005: Me and 5 of my Rocky Mountain Forum buddies had our sights set on Thunder Lake, normally a 15 mile hike, but in winter, the parking lot for Wild Basin is closed, so you have to hike an additional 1.5 miles just to get to the trailhead. 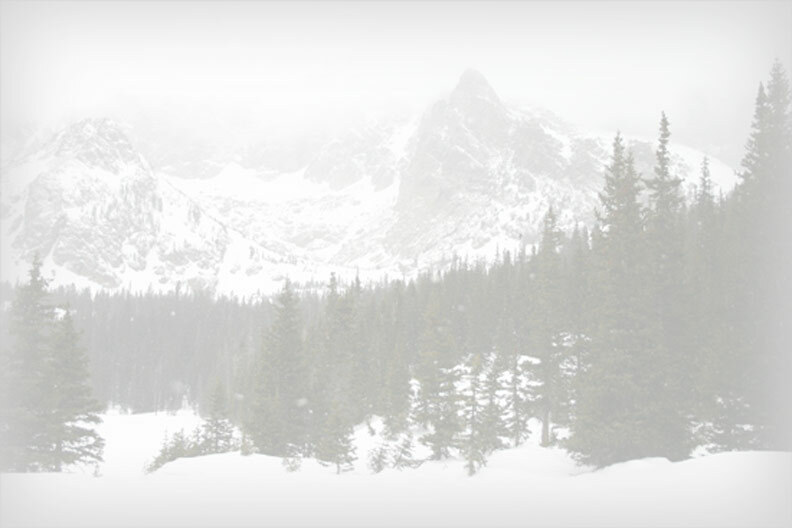 So, 18 miles, with an elevation gain of 2,253 feet, in snowshoes made this adventure by far the the most trying hike I’ve attempted in RMNP. When we finally arrive at the trailhead, we see a sight that cracks us up. The Park Service has an old log cabin “Warming Hut” but it was closed for the season! Hmmmmm. Warming Hut only open in the summer! Grrrreat idea! The first mile and a half of this trail is so beautiful! 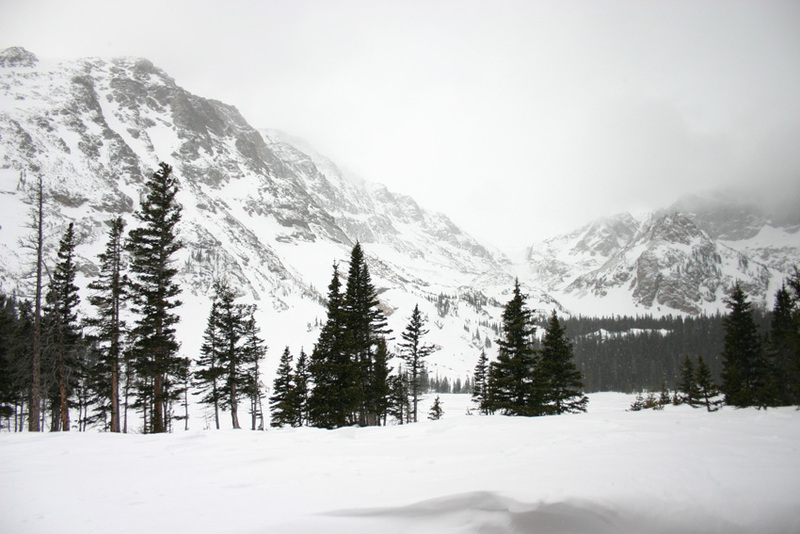 The St.Vrain River was on our left, with all the snow cover made the scene absolutely breathtaking ( no pun intended). We make pretty good time at first because the snowpack was thin enough to not need our snowshoes. But by the time we reached the burn area just before Ouzel Falls, we were slowing down. The sky was pretty hazy, and despite the cold temps we were sweating! What an awesome sight to finally see Ouzell Falls! It’s hard for a Texan to imagine a cold fierce enough to freeze a waterfall with the force of Ouzel, but sure enough, it was frozen solid! After only a few minutes rest, we hit the trail again to discover that a few hundred yards past Ouzel, the trail gets fairly vertical. And the snow by now was mid-calf deep. We were really working hard just to keep a steady pace. 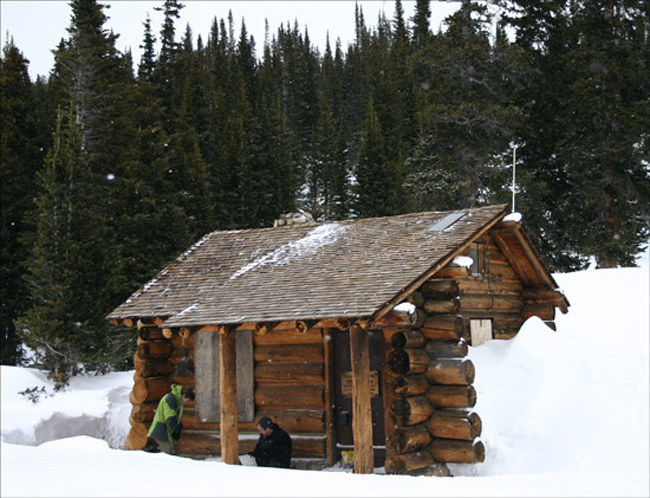 Then, after the Bluebird Lake Trail junction, the snow got to mid-thigh and it was time to put on the snowshoes! Walking in snowshoes takes a little getting used to! The loose snow builds up on top and adds unwanted weight so you have to kind of flick your foot every so often to clear them. You also have to walk with your feet a little wider apart or you’ll step on your own feet. We really slowed down at this part, plus, the going was made more difficult because the trail was so narrow. You had to walk with your right leg on an uphill slope. We found muscles we didn’t know we had. About a mile and a half from Thunder, we took a short breather, then hit it again figuring we were only 30–40 minutes from “home”. But, I swear: that was the longest mile in the history of the entire world. We were all sucking some major wind, and the cold was really creeping in. It’s a weird sensation to be soaking through your gloves and clothes, while having to stop and wipe sweat from you forehead, and knowing that the temperature is in the low teens. If you stopped for more than a minute, the cold would cut to the bone, so our rest stops were just long enough to grab some water and catch our breath! The last mile, besides being really long, is also the prettiest part of the hike so far. A sub-alpine forest so thick that all views of the surrounding peaks is obscured. Under different circumstances, you’d most certainly want to stop and enjoy it, but the anticipation of making it to Thunder was building. We just knew that around that next bend we’d be there -- but alas, we’d turn around the bend and would once again be disappointed to see yet another bend. Finally, we came upon Erik, Smudge and Aaron on their way back down. They assured us we were almost there but we needed to look for a hard-to-see cut-off thru the trees to get down to the lake. If not for running into them, no telling how far past the lake we might have ended up! We finally came to a small meadow to our left that led down to the lake. I was so glad to finally be almost there that I almost started to cry. 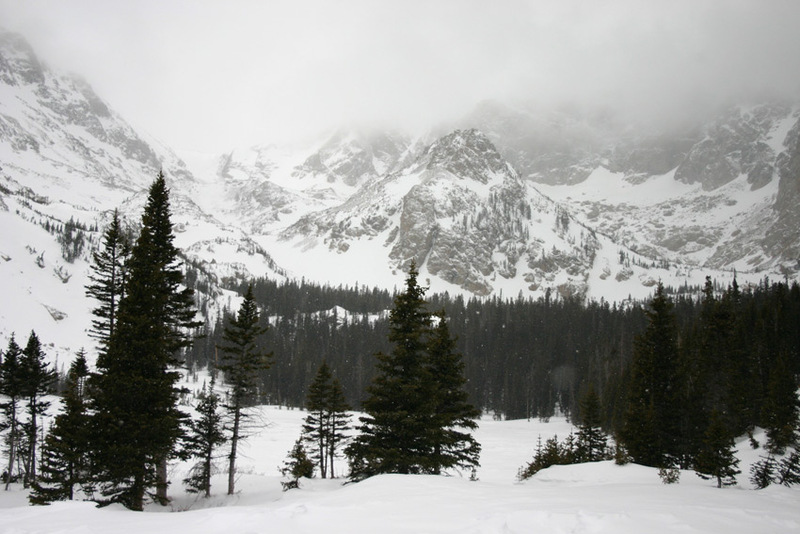 We walked down to the meadow, through one last stand of trees and Bingo – Thunder Lake! I just stood in awe. The scenery was awesome. Thunder sits in a cirque just below treeline. That view of those tree covered peaks was incredible! Worth everything we had gone through. The feeling of accomplishment, especially in light of my failed attempt at Flattop-Hallet the day before was just indescribable. I had wanted to do this hike so bad and to finally be there gave me as good a feeling as I’ve ever had. It was worth every mile. One final note: On the way down it started snowing so hard, we almost had a complete white-out. We could barely see 5 feet in front of us. It was by far the hardest snow I’d ever seen.. Then, at the end, 18 miles later, in our exhausted stupor -- yep, we misplaced our car!!! Noooo problem! What's an extra hour, and a couple of additional miles wandering around to get oriented enough to remember where we parked!! 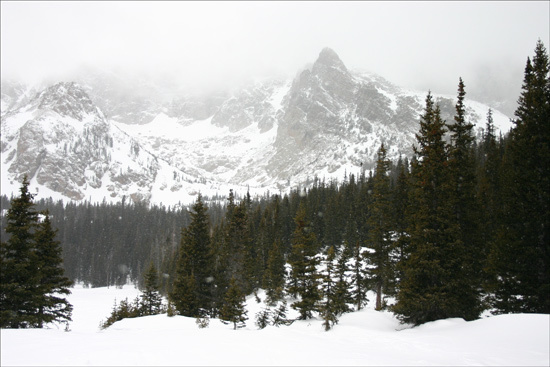 Ahhhhhh. . .winter hiking in the Rockies: Doesn’t get much better than THAT!! !